The UK offshore wind farm market is continuing to lead the way in meeting Europe’s growing demand for renewable wind energy. With nearly 30 per cent of the country’s electricity generated by clean sources in 2017, the UK looks to maintain its world leader position in renewables with the launch of major new projects such as the Triton Knoll offshore wind farm, being developed by Innogy Renewables UK Ltd, in partnership with J-Power and Kansai Electric Power. Within the framework of the project, Nexans has been awarded a contract worth over €35 million by Triton Knoll’s onshore cable installation lead contractor J Murphy & Sons Ltd to supply the land export cable and accessories in order to connect the wind farm to the UK grid. Located around 30 km off the coast of Lincolnshire, Triton Knoll has a planned installed capacity of approximately 860 MW and, once operational will be capable of generating enough renewable electricity to supply over 800,000 UK households. To export the energy generated by the wind farm to the grid, Triton Knoll will rely on Nexans’ 220 kV land export cables, which will transmit the power over a total distance of around 57 km from landfall near Anderby to the new Triton Knoll substation at Bicker Fen. Nexans will supply HVAC cable with two circuits each comprising three individual XLPE-insulated AC cables with an aluminum conductor. Jointing works will be carried out by the teams of Nexans Subsea and Land Systems Business Group using purposely designed cable-jointing containers positioned on the joint bays built by J Murphy & Sons Ltd. This method was chosen by the partners to minimize setup constraints and further reinforce the safety and quality of the installation. To support the Triton Knoll project, Nexans will continue strengthening its local UK pool of experienced staff including project, site and QHSE managers as well as chief jointers. The HVAC export cable will be manufactured by Nexans Germany facility in Hanover, Germany, with the first cable drums scheduled for delivery in the first quarter of 2019, followed by jointing works planned for second quarter 2019. 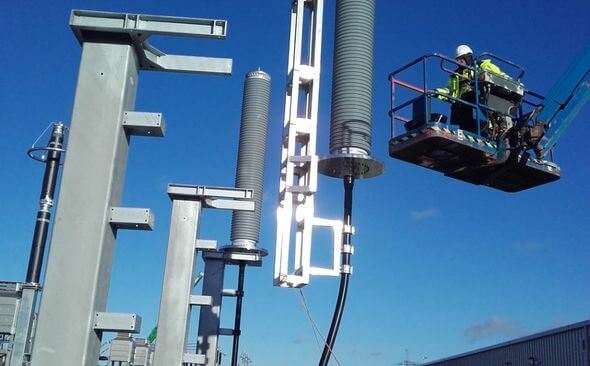 Commissioning and testing of the cable system is expected to take place in summer 2020.